We have created this entire page on the subject simply because we have received so many questions and there is much confusion about this topic. Hopefully below you will find we clear up most of the confusion. What is No Claims Spain? Every year that you do not claim on your car insurance policy – or other type of vehicle that you are insured for – you clock up one years no claims bonus. You sometimes see this also referred to as no claims discounts simply because building up your no claims entitles you to discounts off your vehicle insurance premiums. We may sometimes refer to no claims bonus as NCB for short. In Spanish no claims bonus is called ‘prima de no reclamacion‘. A no claims bonus isn’t specific only to car insurance but it also is applicable and can be earned on other types of vehicle insurance in Spain. Effectively you are being rewarded by the insurance company for being a safe driver. Spanish insurance companies do not want lots of policyholders claiming on their insurance because otherwise they would make huge losses. So they pass back some of their gains in the form of a discount off your next years insurance premium. What is the Maximum No Claims Discount? Clearly Spanish insurance companies cannot keep reducing your premiums to zero, so once you have built up a no claims bonus of five years you will find your premiums do not reduce any further. Nevertheless if you were to compare your premium to that of a driver with no NCB you will often find you’re paying 65% less than the other person. You need to make a decision if you have a relatively minor accident in Spain over whether you should make a claim or not. If you do you will lose your no claims bonus that you have built up so far. Inevitably your premiums next year will rise substantially in most cases. It is a question of getting an estimate of the damage and often depends on whether another party is involved or not. Sometimes making a claim on your insurance is the only option because of the high value of repair. The other issue in deciding whether to make a claim is the fact that you will have to pay the excess on your policy which is usually a minimum of €250 so any claim has to exceed this to make it worthwhile. Is Spanish No Claims Bonus Valid in the United Kingdom? 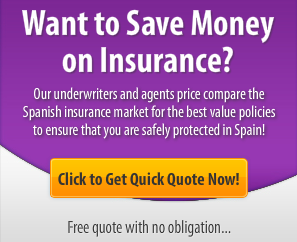 If you are relocating to Spain from a country such as the United Kingdom you will usually find that most Spanish insurance companies will accept whatever no claims bonus you have built up as long as you can prove it. You will need to show your proof of no claims certificate to prove your entitlement to a no claims bonus discount off your insurance quotation. Unfortunately if you’re moving back to the United Kingdom from Spain you will find that virtually no insurance companies will recognise the no claims bonus that you have built up on your Spanish car insurance policy. The other issue you should be aware of is that any no claims bonus you have built up the United Kingdom usually expires after two years. This means if you are not insuring a car in the UK perhaps because you were working abroad, have relocated or gone off travelling, you can find you lose your entire no claims bonus through no fault of your own! Can I Protect My No Claims Bonus in Spain? If you are concerned that you have built up a good no claims bonus then you can usually pay a small additional premium to protect it in the event of a claim. Even though you are accumulating a no claims bonus and discount this doesn’t guarantee that your premiums will not rise because there are other factors involved when you’re insurance company work out your renewal premiums. What is definite is that you are being rewarded for being a careful and safe driver in Spain and that without your no claims bonus clocking up you would be paying substantially more. As with any country young drivers find it especially hard starting out and taking out their first insurance policy in Spain is no different. Young drivers in Spain face great difficulties in finding cheap insurance. At least taking out your first policy, albeit very expensive, gives you the ability to start to accumulate your no claims bonus. The alternative which is often to get someone else i.e. your parents, to take out the policy in their name and put you on as a named driver means you’re never clocking up your no claims bonus and discounts so it is a vicious circle. On our main section on car insurance in Spain we have a small section which covers the topic of no claims, or as it is more commonly known – no claims bonus or no claims discounts. Hi. Just having problems with this now. There are many uk companies that will accept spanish NCD e.g. AVIVA. The problem is that once they get them they find out that Spanish specify how long you were insured and a NCB discount as a Percentage. UK companies will only accept it is specified in years. Hopefully I will find a solution to this otherwise I am actually unable to isure in the UK and lose 18 years NCD. So much for 44 years in the EEC what exactly have they been doing?? Hi, could you tell me how this was resolved please. I’ve just returned from 18yrs in Spain and all you’ve said is now happening to me. Did linea directa help with a letter of proof for your new UK car insurance company?